Sharia law is a distillation of rulings that purport to represent the divine diktat in all worldly affairs. It provides injunctions for the conduct of criminal, public and even international law. Marriage and divorce, the custody of children, alimony, sexual impropriety and much else come within its remit. 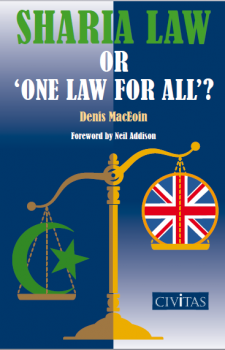 Sharia courts are operating in Britain, handing down rulings that may be inappropriate to this country, being linked to elements in Islamic law that are seriously out of step with trends in Western legislation that derive from the values of the Enlightenment and are inherent in modern codes of human rights. Dr Denis MacEoin holds degrees from Trinity College, Dublin, Edinburgh University and Cambridge (King’s College). From 1979 80, he taught at Mohammed V University in Fez, Morocco, before taking up a post as lecturer in Arabic and Islamic Studies at Newcastle. In 1986, he was made Honorary Fellow in the Centre for Islamic and Middle East Studies at Durham University. He has published extensively on Islamic topics, contributing to the Encyclopaedia of Islam, the Oxford Encyclopaedia of Islam in the Modern World, the Encyclopaedia Iranica, the Penguin Handbook of Living Religions, journals, festschrifts and books, and has himself written a number of books including The Sources for Babi History and Doctrine, Rituals in Babism and Baha’ism, and The Messiah of Shiraz: Studies in Early and Middle Babism; he has also edited Islam in the Modern World with Ahmad al Shahi. In 2007 he published The Hijacking of British Islam, a study of hate literature found in UK mosques, and his report Music, Chess and Other Sins was published online by Civitas in 2009. In 1992 HarperCollins published a volume of his journalism under the title New Jerusalems: Islam, Religious Fundamentalism, and the Rushdie Affair. He has written 25 novels and is translated into some 15 languages. Neil Addison is a practising barrister and the author of Religious Discrimination and Hatred Law, Taylor Francis Publishers, 2006. He runs the website www.ReligionLaw.co.uk, and the Blog http://religionlaw.blogspot.com David G. Green is the Director of Civitas. His books include The New Right: The Counter Revolution in Political, Economic and Social Thought, Wheatsheaf, 1987; Reinventing Civil Society, IEA, 1993; Community Without Politics: A Market Approach to Welfare Reform, IEA, 1996; We’re (Nearly) All Victims Now, Civitas, 2006 and Individualists Who Co operate, Civitas, 2009. He writes occasionally for newspapers, including in recent years pieces in The Times, The Sunday Times, the Sunday Telegraph and the Daily Telegraph.